I previously enjoyed the odd tweet here and there but over the past 6 months have really turned into the tweeter or twit that I am today. I have built an excellent network and try to provide tweets that will help my followers as much as the people that I follow help me. After realising the power of twitter as an outstanding tool in education, I decided to start a faculty twitter account for all of the staff to use. Therefore, @PCSAScience was formed. Initially I was surprised to discover that not many of the students use twitter and only a small handful of students are avid tweeters. 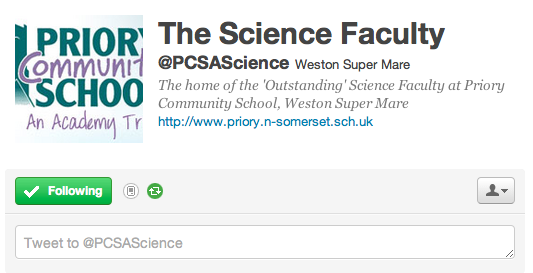 After plugging the faculty twitter account with my classes the followers have slowly grown. The number of followers is just shy of 100 consisting of Students, parents, other teachers and interested educational tweeters. I hope that more students and staff will join in with the twitter action and also parents of the students to show a genuine interest in their child’s learning to develop a learning conversation over the dinner table. I have used twitter to share websites with classes that maybe useful to develop their understanding of certain topics. Some pupils have also enjoyed relevant news stories that I have shared with particular classes to contextualise their learning. When using twitter during lessons I have used twitter to check progress of individuals and form an electronic network within the lesson. This also provides real time feedback to myself as well as other students. Some web tools such www.goanimate.com and http://popplet.com/ have the option to share the students work direct from the application to twitter and this provides an excellent opportunity for collaboration and peer assessment. Some iPad and iPhone application also have this function and with iOS5 this provides endless possibilities to share content from iPhone and iPad. Some apps on the iPad and iPhone also offer the option to share the creations on twitter such as PuppetPals, iCanAnimate and ComicLife. #tags have been used so that followers can quickly identify relevant tweets and form an easy online revision resource that can be accessed in school, at break, at home and on the move. I hope that twitter will help students to learn and also provide an insight into lessons at Priory Community School for parents and also educational tweeters and is an excellent way of sharing best practise. Posted on November 14, 2011, in Apps, elearning, General, iPad, iPhone and tagged apps, mobile devices, mobile technology, teaching, technology. Bookmark the permalink. Leave a comment.